The Burgwin-Wright House will host a show by renowned quilter and multi-disciplinary fiber artist, Celeste Butler. Beginning with an opening reception on Friday, August 24 from 6:00-9:00 p.m., the show ends on September 21. Admission is free for both the reception and show. Based in Omaha, Nebraska, Butler utilizes quilting to tell stories. She considers her self to be a griot, but one who communicates with cloth rather than with music and singing. In addition to stitching together pieces of fabric to form shapes and designs, Butler frequently uses a brush to add paint or dye to her quilts. She also employs a technique called thread painting to add color, texture and shading. 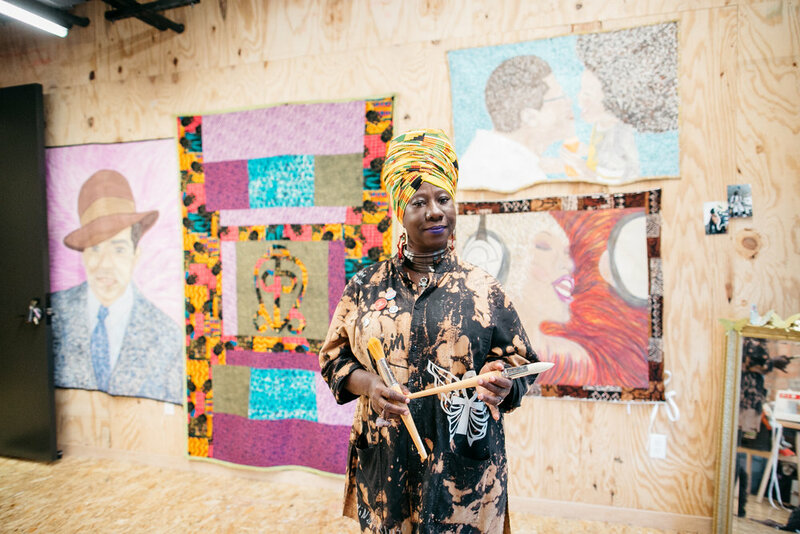 Butler recently wrapped up a fellowship at Omaha’s Union for Contemporary Arts, she teaches at Metropolitan Community College and she was a featured speaker at the 2018 National African American Quilt Convention. She often facilitates community quilting projects, one of which involved mothers who had lost children to violence. Butler’s opening at the Burgwin-Wright House is part of Fourth Friday Gallery Night, a monthly art walk in the downtown area sponsored by the Arts Council of Wilmington.